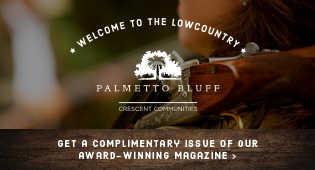 Whiskey, Wine & Wildlife (W3) is a culinary event on Jekyll Island, Georgia, that blends gourmands with nature, taking place February 7-10. 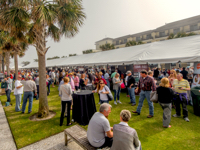 W3 artfully combines legendary beverage tastings of all kinds – from all types of spirits, beers, whiskies and wines, along with inspired cuisine from some of the South’s best chefs and local culinary superstars, with a chance to experience coastal wildlife up-close. The weekend’s events will raise funds and awareness for programs of the Jekyll Island Foundation. Visit www.whiskeywineandwildlife.com for more information on events, W3 Weekend Getaway Packages and fun volunteer opportunities. 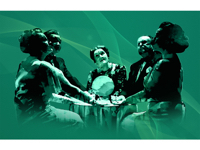 The smash comedy hit of the London and Broadway stages is also the Arts Center of Coastal Carolina’s winter production Blithe Spirit, onstage February 12-March 3. This brilliantly funny revival is from the playwright of Private Lives, none other than the witty, clever, and classy Noel Coward. In Blithe Spirit, he offers up the cantankerous but popular novelist Charles Condomine as his hero. Condomine is married to the super-rational Ruth, his second wife, after his first wife passed away. When researching his latest thriller about a spirit medium, he impetuously holds a séance for background material. But what begins as a lighthearted experiment for the sake of art results in marital mayhem, chaos and misunderstandings, as a good farce should! Quite by accident, the famously eccentric medium, Madame Arcati, summons the spirit of Charles’s first wife, Elvira, and try as she might, cannot make the disruptive presence go away. Charles, to his disbelief, discovers Elvira has suddenly materialized, and the spirit can only be seen by him (and of course the audience)! And this is just the beginning! What follows is a hilarious spectral variation on a love triangle, with Charles torn between two equally strong women, and we know he doesn’t stand a ghost of a chance. The Arts Center production will be directed by NYC’s Russell Treyz. The show, when revived on Broadway in 2009 won the Drama Desk Award for Outstanding Revival. Tickets and three-show subscription packages can be purchased online or by calling the box office. Preview performances, February 12-14, are $39 for adults and $26 for children ages 5-15. Regular performance tickets, Feb. 15-March 3, are $49 for adults and $36 for children ages 5-15. To purchase, visit www.artshhi.com or call (843) 842-ARTS (2787). It’s one of the best parties of the year with denim, dancing and dining. Bring your BLING to Jewels & Jeans! Deas Guyz will bring the jamz, so don your sparkles, grab your friends and plan to rock the dance floor and savor the fabulous eats. Don’t miss this year’s “Jewels & Jeans” gala Saturday, March 2, from 6 to 9:30 p.m., at the Country Club of Hilton Head, 70 Skull Creek Drive. While the party is awesome, the proceeds from the evening are the real stars. They fund the Foundation For Educational Excellence, which enables them to award grants to Beaufort County Schools for innovative, cool projects in the classroom. Since 2009, proceeds from Jewels & Jeans and other grants have allowed the Foundation to award over $215,000 to implement innovative projects not funded through traditional channels. Last year, over 10,000 students were directly impacted by the grants. To top it all off, this year the Foundation will recognize Dr. Jane Upshaw as the recipient of the 2019 “Peggy May Inspiration Award” for her professional contributions over three decades to advance education throughout the Lowcountry. The annual award recognizes those who demonstrate extraordinary dedication, passion, and skills that influence and inspire local students. From her early teaching days at May River Academy to becoming the first female Dean of the University of South Carolina Beaufort and establishing USCB as a regional and comprehensive four-year university, Upshaw has exemplified dedication to the future of education in the Lowcountry. For more information or to purchase tickets, visit www.FoundationEdExcellence.com or call (843) 301-7150. The Foundation for Educational Excellence is a 501©3 and a fund of Community Foundation of the Lowcountry. The Women’s Association of Hilton Head Island (WAHHI) is pleased to announce the February luncheon to be held at the Sonesta Resort in Shipyard Plantation on Thursday, February 21. The keynote speaker is founder and CEO of Spartina 449, Kay Stanley. A shopping bazaar featuring local vendors opens at 10 a.m.; social hour begins at 11 a.m.; luncheon and program at noon. 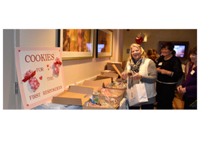 Following tradition, WAHHI will also collect hand-baked cookies to distribute to first responders on Hilton Head Island and in Bluffton. The luncheon is open to WAHHI members and the general public. To reserve your seat for the luncheon, please visit www.wahhi.org; contact Anne Lambdin at (443) 418-6445; or email reservations@wahhi.org. Tickets are $30 ($32 online) for members and $38 ($40 online) for guests.